LaRon Landry of the Indianapolis Colts has been suspended without pay for the next four games of the 2014 regular season for violating the NFL policy on performance enhancing substances. Landry will be eligible to return to the Colts’ active roster on Monday, October 27 following the team’s October 26 game against the Pittsburgh Steelers. The Indianapolis Colts today signed safety Dewey McDonald to the active roster from the practice squad and waived wide receiver Da’Rick Rogers. The team also placed outside linebacker Robert Mathis on the Reserve/Non-Football Injury list. McDonald, 6-0, 220 pounds, was originally signed by the Colts as an undrafted free agent on May 12, 2014 and was signed to the practice squad on September 1. Collegiately, he transferred to California University of Pennsylvania from Fairmont State. As a senior captain with the Vulcans, he tallied a career-best 89 tackles, 6.0 tackles for loss, three interceptions (all returned for touchdowns) and eight passes defensed. His three interception returns for touchdowns made him the first PSAC player to accomplish the feat in over 10 years. McDonald finished his career with the second-most career interception return yards (475) among active Division II players. Rogers has played in five career games (three starts) with the Colts, totaling 14 receptions for 192 yards and two touchdowns. He also recorded one reception for 46 yards in two postseason contests. Rogers was originally signed to the Colts practice squad on September 2, 2013. This week’s “Back-Up of the Game” presented by Venyu is safety Mike Adams. Labeling Adams as a “backup” isn’t totally true but this is a guy who didn’t take consistent first team reps at safety until the end of Training Camp. Adams also didn’t have anywhere close to a full offseason with the Colts, after the team signed him near the end of OTAs. But after four weeks, Adams has done a very solid job at stabilizing the safety spot next to LaRon Landry. “He came in and did what we expected him to do,” Darius Butler says of his fellow secondary member. On Sunday against the Titans, Adams had a pair of interceptions and a key second quarter pass breakup that held the Titans to a field goal. The interceptions were the 14th and 15th of the 10-year career for Adams. It was another solid defensive effort from the Colts with the unit starting to create some more chances for the offense. “We have to play with an edge,” Adams says of the defense. “We got to match number 12. If 12 is playing well, we got to play well, too. The Indianapolis Colts today signed inside linebacker Andrew Jackson to the active roster from the practice squad and waived-injured inside linebacker Mario Harvey. If Harvey clears waivers, he will revert to the team’s Injured Reserve list. Jackson was selected by the Colts in the sixth round (203rd overall) of the 2014 NFL Draft and was signed to the practice squad on September 1, 2014. At Western Kentucky, he registered 326 tackles (174 solo), 6.5 sacks, five forced fumbles, four passes defensed, one fumble recovery and one interception in 37 games played (33 starts). Jackson became the 10th player in school history to record at least 300 tackles, as his total ranked 14th among active NCAA Football Subdivision players. He competed in the 2014 East-West Shrine Game and earned All-Sun Belt Conference first-team honors in two consecutive seasons (2011-12). 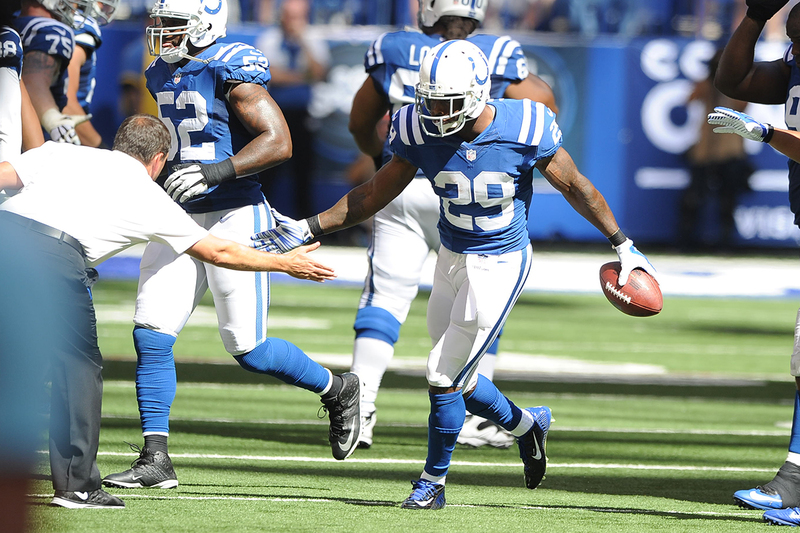 Harvey played in 28 career games with the Colts (2012-14) and recorded 15 tackles (13 solo) and 16 special teams stops. In three games this season, he posted one special teams tackle, spending time at both the fullback and inside linebacker positions. Harvey was originally signed by the Colts to a reserve/future contract on January 20, 2012. This week’s winning recipe comes from Christopher Park who has a fall-inspired take on a traditional tailgate favorite. How do you make pulled pork even better? Add some maple bourbon and some pumpkin and you got the perfect recipe for a fall day filled with football! Thanks for sharing Christopher! Think your tailgate recipe is better? Enter it here. The Indianapolis Colts today signed outside linebacker Trevardo Williams to the practice squad and released defensive end Nnamdi Obukwelu from the practice squad with an injury settlement. Williams, 6-1, 237 pounds, was originally selected by the Houston Texans in the fourth round (124th overall) of the 2013 NFL Draft out of the University of Connecticut. He did not play in any games in 2013 after being placed on Injured Reserve on August 31, 2013. Williams was waived on August 1, 2014 and claimed by the Arizona Cardinals the following day. He was waived by the Cardinals on August 8. At UConn, Williams started 30-of-50 games and recorded 134 tackles (85 solo) and a school career-record 30.5 sacks, which ranked as the sixth-best total in Big East Conference history. He also registered 40.5 tackles for loss, which was the fifth-best career total in school history. As a senior in 2012, Williams was a First Team All-Big East choice after leading the conference with 11.5 sacks to go along with 43 tackles. Obukwelu was signed by the Colts as an undrafted free agent on May 13, 2014 and was signed to the practice squad on September 1. He played in 39 career games at Harvard and notched 109 tackles, 21.0 tackles for loss, 9.0 sacks, one forced fumble and one fumble recovery.